X-Men: First Class is not a sequel but a reboot like the recent J.J. Abrams version of Star Trek. The franchise has aged well, but First Class brings fresh blood, young faces, and the hormones of teenagers. The brink of adulthood is a time of excitement, anticipation, the search for one’s place in the world, and the risk of devastating failure. Luckily for me, I’m a sucker for movies about finding your calling. First Class begins with set pieces from the boyhoods of Erik Lehnsherr (later “Magneto”) and Charles Xavier. Erik’s mother was killed by a Nazi scientist named Sebastian Shaw (Kevin Bacon) — a mutant with the power to absorb energy — while Xavier grew up in the lap of luxury. The movie is set in the early 1960s with a young Charles Xavier (now played by James McAvoy) graduating from Oxford with a thesis on human mutation. After Charles and his adopted sister Raven (Jennifer Lawrence, Winter’s Bone) demonstrate their abilities — telepathy and shape-changing — the CIA (embodied by Rose Byrne and Oliver Platt) invites them to join. On their first mission they encounter Erik (now Michael Fassbender) using his metal-seeking powers to hunt down his mother’s killer, Sebastian. Charles and Sebastian are an excellent hero/villain pair. The half dozen screenwriters have done an excellent job layering the details. In a later conversation Charles says that Dr. Jekyll and Mr. Hyde isn’t really about good and evil, it’s about man’s animal nature and his civilized veneer. (You can find the same philosophy in Terrence Malick’s The Tree of Life where the two sides are called “nature” and “grace.”) They are two sides of the same coin. In fact, the film’s most prominent visual metaphor is a coin. According to First Class, the cold war — Capitalism versus Communism — is really the result of Sebastian trying to weaken the humans so that his own war against them will be easier to win. He believes that if you are not the master of the conflict, then you will be enslaved by your enemies. If his realpolitik view of the humans is right, then he is the better choice to lead the mutants. Charles is “the good guy” and a wise mentor to boot. He believes that the tension can be deflated through trust and understanding, that violence can be averted. If he’s right, then he is the better choice to lead the mutants. Their ideological sparring feels very timely with the current political situation in this country — the political right trying to shrink the burden of government, the left trying to use government to save the broader economy. It comes down to whether you believe humans are generally good and trustworthy, or whether you believe they will take advantage of you and bleed you dry. Liberal mutants would side with Charles, Libertarians with Sebastian. Sebastian gets away, so Charles and Erik regroup at the CIA compound. Their next job is to broadcast a telekinetic “ping” that locates young American mutants. They then travel to the coordinates recorded in the ping, and use Charles’ telepathic ability to pick them out from the crowd. Soon there are a handful of young recruits training in the CIA compound. As young adults, they all need to hone their raw power into something more civilized and predictable. Charles and Erik, being older and more experienced, lead the training and act as chaperones. Raven and Hank (Nicholas Hoult) share an obsession with body image. Raven is naturally blue and leathery while Hank’s feet want to grow hair and prehensile toes. Some have said that subtext beneath the mutations is racial prejudice — and it is — but here it’s also about sticking out and fitting in — concerns that any teenager might face. 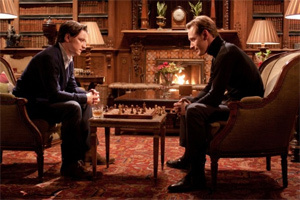 Meanwhile, Sebastian and his small cohort of mutants (Azazel, played by Jason Flemyng, looks like a devil and can instantly teleport; Emma Frost, played by January Jones, can read minds and morph into a “diamond form”) are using Sebastian’s wealth and cunning to bring the world’s two superpowers to the brink of war. They convince the U.S. to stage missiles in Turkey, then convince the Russians to retaliate with missiles placed in Cuba. With close-range nukes pointing at each other, Sebastian hopes he can goad the nations into war. President Kennedy sets a blockade around Cuba and dares the Soviet Union to cross it. Behind the scenes, Sebastian is trying to ensure that the Russians don’t chicken out, while Xavier and his colleagues try to stop them from crossing the line. X-Men: First Class plays as a tense and exciting summer action movie. The young actors bring their charisma, their enthusiasm, and their hormones. There are enough special effects and explosions to entertain the most Hyde-ian reptilian brain. That much would earn X-Men: First Class a modest recommendation. That director Matthew Vaughn, producer Bryan Singer, and the team of screenwriters could tap into the same zeitgeist as Terrence Malick and have something interesting to say, makes it all the better.